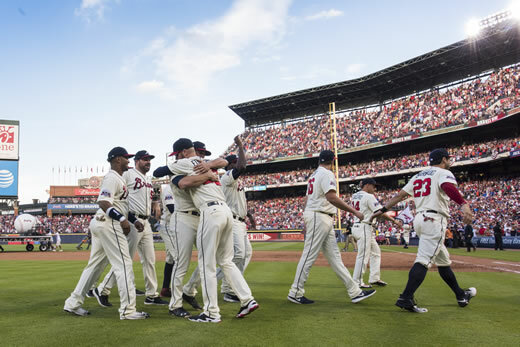 The Atlanta Braves and Emory Healthcare have announced a new medical partnership that names Emory Healthcare as the Official Team Healthcare Provider of the Atlanta Braves. The deal will provide the Braves organization with comprehensive and seamless state-of-the-art medical care. It includes access to Emory's world class Sports Medicine, Orthopaedics, and Spine Center physicians, as well as priority access for all medical needs to Emory's seven hospitals, advanced imaging equipment and physicians in more than 70 medical specialties. It will also provide the Braves access to Emory's sports science research and performance measurement expertise at the new Emory Sports Medicine Complex in Brookhaven, which will open this fall. "We are thrilled to develop this relationship with Emory Healthcare," said John Hart, Braves president, baseball operations. "This agreement is very important to our club and will help us to continue to provide the best possible healthcare to our players and staff." "Everyone at Emory is very excited to play a role in helping the Braves organization perform at the highest level," said Scott D. Boden, MD, director of Emory Orthopaedics & Spine Center. "Today, caring for professional athletes requires seamless integration of all medical needs in addition to musculoskeletal care, and Emory is honored to be trusted with this responsibility for the Braves organization," said Jonathan S. Lewin, MD, President, CEO and Chairman of the Board of Emory Healthcare. As part of the partnership, Emory Healthcare will be opening a new outpatient orthopaedics clinic in Smyrna, Ga., giving Braves players and staff easy access to evaluations, treatment and high-quality imaging. Emory Sports Medicine physicians who will be providing care for the Braves are: John Xerogeanes, MD, director of Emory Sports Medicine Center, along with physicians Kyle Hammond, Spero Karas, Jonathan Kim, Lee Kneer, Scott Maughon, Ken Mautner, and Jeff Webb. They join the Braves medical staff roster, which includes Head Team Physician Gary M. Lourie, MD, and returning physicians Marvin Royster, Tim Griffith, Jeff Hoadley, and Brooks Lide. SunTrust Park, the new 41,000-seat home of the Atlanta Braves, is being developed by the organization in partnership with the Cobb-Marietta Coliseum and Exhibit Hall Authority and will be completed by Opening Day 2017. Located in Atlanta at the intersection of I-75 and I-285 in the bustling Cumberland area, SunTrust Park will flow directly into The Battery Atlanta, a 1.5 million square foot mixed-use development, featuring boutique shopping, chef-driven restaurants, an Omni Hotel, The Coca-Cola Roxy Theatre, 550 residences and One Ballpark Center, Comcast's regional office headquarters. Powered by Comcast's all-fiber network and delivering multi-terabit capabilities, SunTrust Park and The Battery Atlanta will have the highest-capacity network serving any stadium and mixed-use development in the nation. The Battery Atlanta is being privately developed by the Braves along with retail partner Fuqua Development, office developer Pope & Land Enterprises and Pollack Shores Real Estate. Visitors can get a sneak peek of SunTrust Park and The Battery Atlanta at braves.com/SunTrustPark or batteryatl.com. Emory Healthcare, with more than 16,000 employees, is the most comprehensive, academic health system in Georgia. Emory Healthcare has $3 billion in annual net revenue and provides $72.3 million in charity care. System-wide, it has 1,976 licensed patient beds. Emory Healthcare is the only health system in Georgia with three Magnet-designated hospitals, Emory Saint Joseph's Hospital, Emory University Hospital, and Emory University Orthopaedics & Spine Hospital, for nursing excellence. Emory Healthcare's core purpose: "To serve humanity by improving health through integration of education, discovery and health care." For more information, visit emoryhealthcare.org.